Henry Mandel had big plans during Manhattan’s glitzy 1920’s. While sleek Art Deco hotels and office buildings were going up in Midtown he had his eye on a long row of pre-Civil War homes in Chelsea. Mandel had started out years earlier building tenement buildings with his father. He soon lost interest in tenements, however - Henry Mandel wanted to make a bigger splash. As the 20s progressed he built progressively larger and more elaborate projects. Sometimes referred to as the Donald Trump of the ‘20s, he began buying up the properties on 23rd and 24th Streets between 9th and 10th Avenues. Clement Moore, the author of “A Visit from St. Nicholas,” had developed the block when he divided up his family estate, “Chelsea.” On the 23rd Street block, in 1845, he commissioned Alexander Jackson Davis to design 36 elegant Greek Revival brownstone townhouses. 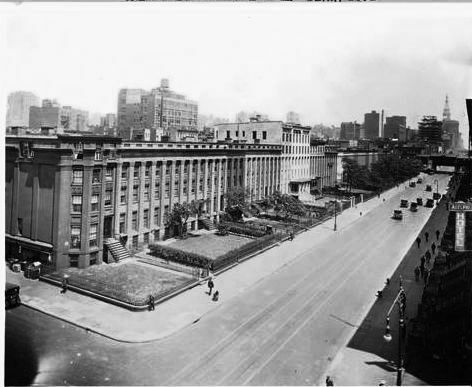 The row was designed to appear as a single, uniform structure or “terrace.” Unusual for Manhattan, each had deep front yards planted with shrubbery and trees. By October 1929, a few weeks before the collapse of the stock market and the onset of the Great Depression, Mandel had acquired and demolished all the structures on the enormous block of land. All except for Tillie Hart’s house. 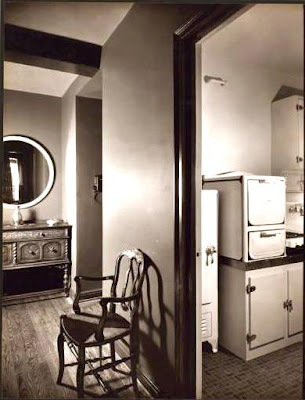 Tillie leased 429 West 23rd Street and, although her lease had legally expired, she refused to leave. Tillie fired a barrage of bricks and rocks at anyone who approached the sole-surviving house. A court battle ensued while she barricaded herself inside. Finally, just four days before Black Tuesday, sheriffs gained entry and moved all of Tillie Hart’s things onto the street. She held out one more night, sleeping on newspapers in her once-grand bedroom, then gave up. The following day her house was destroyed. The Depression did not impede the indefatigable Mandel. He was fond of the Tuscan-influenced designs of the firm of Farrar & Watmough and commissioned them to design his gargantuan structure. In 1930 the central ten buildings were completed and a year later the four corner towers were finished. Mandel used Clement Moore’s name for the project, London Terrace. 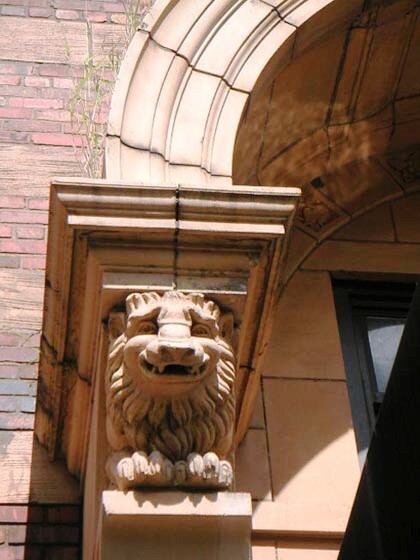 The Tuscan-themed architecture used vertical rows of alternating red and cream-colored brick, terra cotta ornamentation, whimsical carvings and exuberant mosaics. Each of the entrances was different yet harmonious. To describe the new London Terrace was to use superlatives. Consuming the entire city block, it was the largest apartment building in the world with 1665 apartments. It boasted the largest swimming pool in the city – 75 feet by 35 feet, with mosaic walls and viewing balconies. 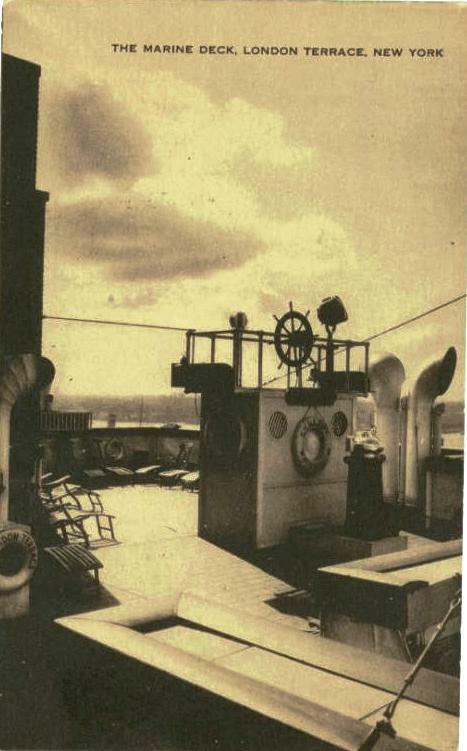 Twenty-one stories above the street a “marine deck” was designed to mimic that of a luxury ocean liner. It had a fully-equipped gymnasium, a recreation club, a rooftop children’s play yard with professional supervisors, and a large dining room. The doormen were dressed as London bobbies. In the 1930s, before ubiquitous telephones, a message center took incoming calls and delivered messages to tenants’ apartments. There was a free messenger service for hand-delivering notes or packages around the city. The tenants published their own newsletter, The London Terrace Tatler. While the London Terrace was being completed Mandel had Farrar & Watmough busy designing the equally immense Vendome apartments on West 57th which were completed in 1931. He discovered, however, that he could ignore the Depression for only so long. In March of 1932 he filed voluntary bankruptcy with liabilities of $14 million and assets of $380,000. He owed $5.5 million on London Terrace alone. Unable to pay alimony to his ex-wife, he was jailed in 1933 – court papers showing his potential income at the time was $60 a week. Mandel died in 1942. 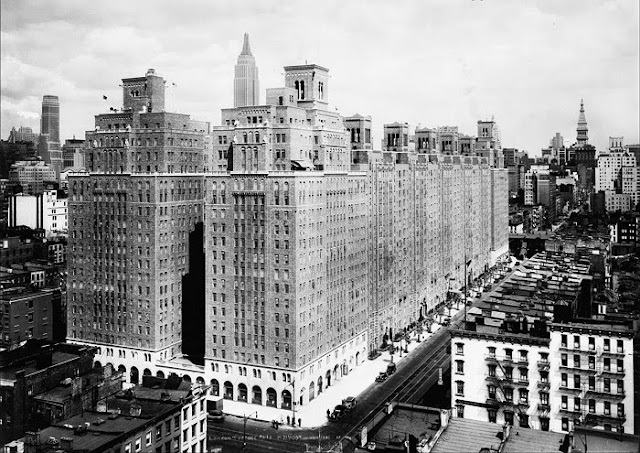 In 1948 the development was broken up and sold to independent concerns. The ten central buildings were sold to a partnership of four contractors while the corner towers were purchased by a separate management company. The leviathan, aging development suffered during the 70s and 80s both inside and out. 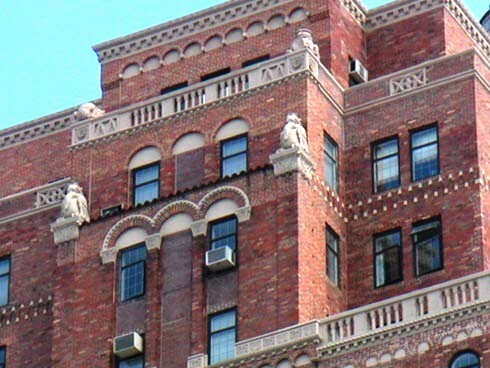 Tenants complained of leaks, mold and deteriorating window frames and the façade was in serious need of maintenance. 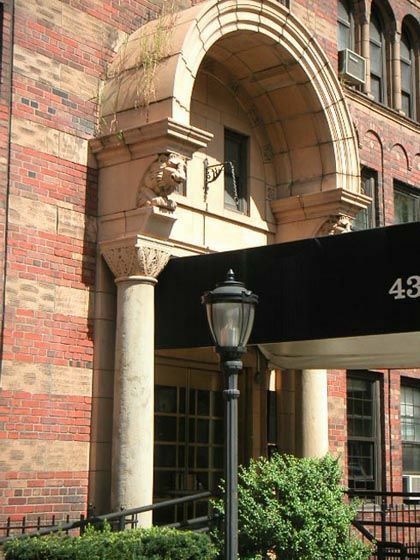 In 1987 the corner towers were converted to co-ops and the center buildings, which remained rental units, were renamed London Terrace Gardens. 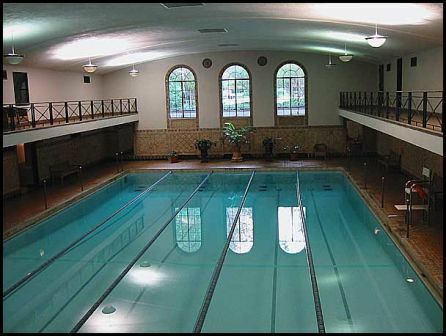 The sponsor of the co-ops initiated a $10 million renovation including new windows, new plumbing, restoration of the pool and façade restoration. In 1997 a two-year project headed by Sygrove Associates addressed the lobbies. That venture repaired seriously water-damaged ornate plaster ceilings, replacing damaged marble walls with new stone and bringing back period paint colors. Although celebrated names like Chelsea Clinton, Debbie Harry and photographer Annie Leibovitz moved in, as late as 2005 maintenance problems still existed. But five years later the entire complex has undergone major repairs and renovations bringing it back to Henry Mandel’s big vision. Interesting! This was my father's last residence before he died. 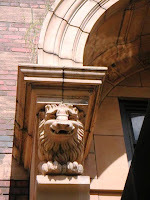 It's nice to read some of the history surrounding the buildings and area. Thank you.